Considering an extravagant Russian ball inspired by Faberge for your wedding? If so, this is the perfect chance to take a walk back in time to the world of czars and czarinas! Imagine a soiree with decorations inspired by the grandeur of Russian royalty and the opulence of Peter Carl Faberge’s exquisite creations. 1. For a reception venue, the ballroom of a hotel would capture the perfect feel of grandeur. 2. A hall in a museum or historical building would provide the right period look. 3. An expansive veranda in a country club or a penthouse suite with a sweeping view of the city could be transformed into a scene fit for the czars. Be ready to bring that scene to life with details, details, details—from touches of the ornate rococo style used in Russian interiors of that era, to fairyland references that cast an ethereal, almost magical aura on the celebration. Lights glistening, glittering, and glowing everywhere bring that dreamlike feel to the ball scene—from tealights in sparkling votives to hanging scones. 1. Choose decor elements in rich royal blue and glittering gold and present these amidst a sea of gossamer white. 2. Hang ceiling swags of white tulle, satin, or other soft fabrics to create that dreamy, romantic ambiance. Drape more of these white fabrics throughout the scene—from the guest tables and seats, to the grand, fairytale-inspired favor display. 3. For the ultimate touch of enchantment, have lights everywhere. Almost like pixie dust, sprinkle the scene with tiny points of light cast with pearl accents. The look will be totally captivating! Amidst this dreamlike Russian ball setting, your guests deserve nothing less than festive Russian sweets and pastries as well. Start with a towering fondant cake decorated to match the favors of the wedding—in this case, Fabergé-inspired porcelain eggs in royal blue and gold. For a whimsical touch, have the groom’s cake shaped like an actual Faberge egg, with edible trimmings in the same colors. –	“Russian Cream” – a panna cotta-like custard cream served in glass goblets and topped with rich fruit compote. Check out About.com’s recipe. –	“Russian Tea Cakes” – the famed melt-in-your-mouth, shortbread-like cookie balls made with finely chopped nuts and dusted with confectioner’s sugar. See a recipe from Betty Crocker®. Accompany all these sweet treats with piping hot pots of Russian tea and coffee, available from gourmet food outlets that specialize in ethnic foods. Footed porcelain eggs reminiscent of Faberge’s exquisite creations serve as the perfect guest favor for this Russian ball-inspired reception. Each holding a gold foil-wrapped chocolate truffle, they are displayed on a fittingly grand favor presentation table. 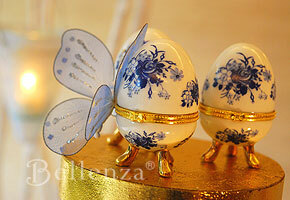 What more fitting thank-you gifts could you give on this occasion than lovely porcelain eggs? Painted with delicate flowers in royal blue and finished with brilliant gold trim, these antique-style containers could hold a gold foil-wrapped chocolate truffle at the reception—then serve as elegant dresser accessories or jewelry boxes when taken home. 1. Drape the table in white satin, topped with delicate white tulle. 2. Have the table appear to float as light filters through the draped tablecloth. 3. Position a tiered favor stand with a glittering gold finish in the center of the table and arrange the favors on each tier. 4. Set this display against a dream-like backdrop of delicate white branches, with royal blue and white butterflies daintily perched on them and tealights in hanging votive holders providing an enchanting glow. 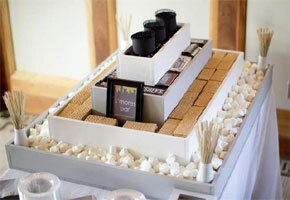 If space permits, this favor display can also serve as your guestbook table. Or for a whimsical touch in keeping with the theme, the backdrop can double as a “wishing tree” where guests can write special messages to you on little cards and attach them to the tree branches with ribbon. Who says the magical days of Russian royalty can’t be recaptured for your wedding reception? With the right decor touches reminiscent of the rococo interiors of that era—and using the famed Fabergé eggs as a focal point—you can have your dream celebration decked out like a grand Russian ball. Infusing the scene with a magical, fairyland look simply serves to remind you and your guests that this is a dream after all! For further reading on the significance of this theme, check out PBS.org’s website. 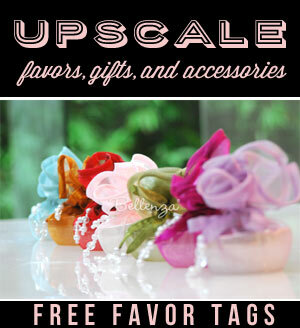 Next Place Card Presentations, From Fun to Feminine to Fab Ideas! I love this romantic theme. I was thinking of this theme for a fairytale wedding this summer. Those eggs are so cute! Thanks for stopping by! 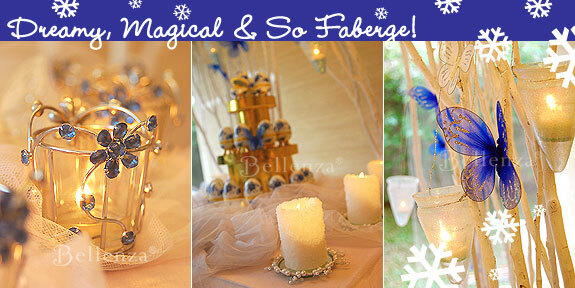 Yes, you can definitely incorporate such a theme for summer fairytale wedding. This gave me the idea of having a wedding cake fashioned after those cute eggs. My wedding reception is a in blue and gold, so this is perfect. We’re filling the eggs with a bunch two pieces of Hershey’s Kisses symbolizing the two of us. 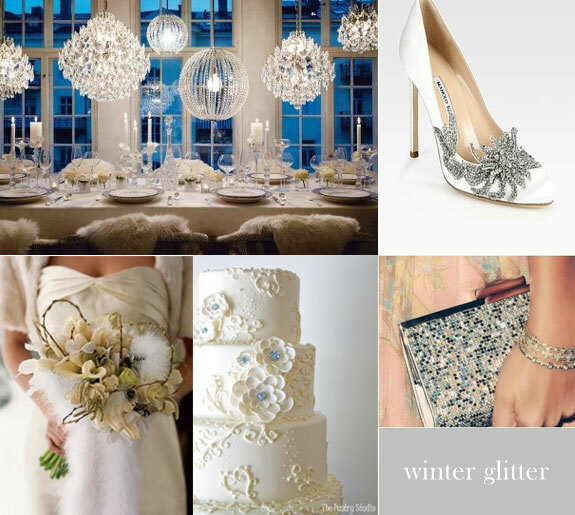 I am going to have a theme very similar to this one for a winter wedding next year. The look of snow falling and icicles all during the Christmas season is so romantic! 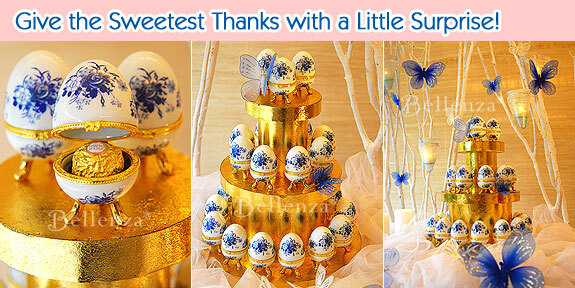 Luv the eggs, too:) Would you recommend a navy blue and gold color palette for this winter theme? Navy blue and gold are definitely a nice color combo. You can even apply different shades of blue for a monochromatic palette filled with gold accents. Then use ivory or white as lovely finishing colors. Fab idea!! Im marrying a Russian and this Faberge idea is splendid!!! Thanks a bunch for having these little eggs as I cannot find any such favors anywhere else online =( Although my colours are red and gold (late summer/early fall type wedding), do you think the blue of the eggs will throw off the colour scheme?? Do they only come in blue? 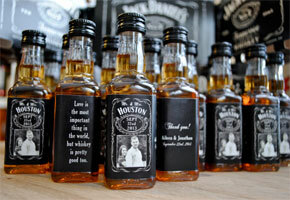 Thanks again, big help =) Cheers! That’s a great question, Vikki! Congratulations on your upcoming wedding, too. Since you have a red and gold palette, the blue of the eggs (only available in blue) may cause the color combo to become uneven or imbalanced. Because red is such as vibrant color, incorporating a color that is closer to its hue would be a safer bet. Ivory is also perfect! Another option is to choose a favor that is either red or gold by itself. In this way, you’re assured that the item won’t clash with your chosen palette.